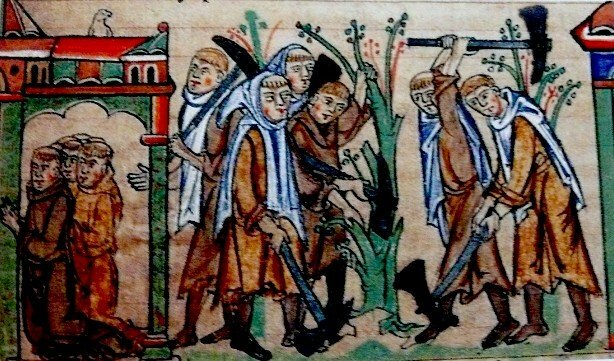 Introduction: At the end of the twelfth century the Cistercian Order was engaged in a process of reaffirming and reasserting the values and ideals that characterized the early decades of the order. From the 1170s until the early thirteenth century a number of exemplum collections were issued, especially at Clairvaux, which summarized the conviction of the brethren that their order was unique and had a special role to play in the church. In the Exordium Magnum Cisterciense, which was composed between 1190 and 1210, for example, spectacular sayings and deeds of Bernard and of the first abbots of Clairvaux were edited on the basis of both oral and written traditions. We can look at the Exordium Magnum as a conservative document that carefully took diverse materials and gave them a uniform appearance. In the process some of the more unusual stories were weeded out or toned down, as in the case of the fifth abbot of Clairvaux, Pons. Pons had become abbot of Grandselve, a Clairvaux daughter, in 1158. In 1165 he became abbot of Clairvaux, and then in 1170 was elected bishop of Clermont-sur-Ferrand, where he remained until his death in 1189. Several chapters were devoted to Pons in the Exordium Magnum, some of them based on material already collected by Herbert in his Liber Miraculorum from 1178-81. One of Herbert’s stories deal with Pons’ promise to a wayward young monl that if he remained faithfully in the monastery, he, the abbot would guarantee the young man’s salvation. Conrad of Eberbach, the editor of the Exordium Mangnum, made this story into a little sermon of edification urging the brothers to remain true to their vocation. There is another version of this same story that emerged at Langheim, a Bavarian house of Ebrach, which in turn was an offspring of Morimond. Here a monk named Engelhard compiled a collection of exempla for the nuns of a nearby house at Wechterswinkel. Twenty-five years ago the great and little-known Cistercian historian and philologist, Bruno Griesser, brought this collection to light and provided a good review of its contents. Griesser noticed the story of Pons but did not indicate its parallelism with the Exordium Magnum story. He printed only the first and last lines of the story, so it was only when I saw the Paris manuscript from which Griesser worked that I realised that here was a fresher and much more striking version of the story concerning an abbot’s devotion to one of his monks. The story is quite simple in Engelhard’s version. A young man comes to Grandselve and is taken in. He does well for three years and impresses everyone with his religious devotion. But then he begins to doubt, and his physical appearance reveals his state of mind: ‘His face sadder, his look harsher, his speech more bitter, his movements slower…’ He was going from bad to worse.